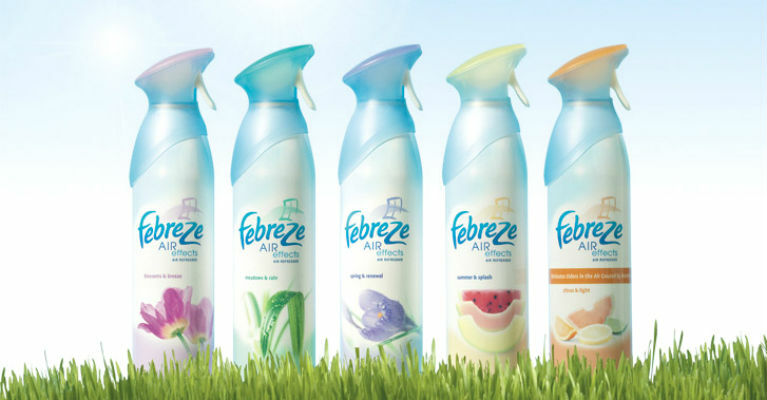 Febreze is one of the most popular air fresheners produced by the famous American company Procter & Gamble. According to the manufacturer, this product works in a unique way by trapping or shutting in molecules of odor in a chemical that comes in the shape of a donut. So, it is very important to remember that Febreze doesn’t really remove odor molecules or clean the item. The molecules of odor are there, but you won’t be able to smell them because the chemical is covering this smell. In other words, you can only smell the chemical. This fact alone should make you skeptical. It is a well-known fact that inhalation of chemicals is bad for the health and some of the ingredients found in Febreze and other similar products are capable of causing irritation in the lungs. What is even more shocking, this product should actually be inhaled. If you want to do some research, you will notice that there is not much information about Febreze and similar products on the Internet. However, the EWG or Environmental Working Group has run a test for all the ingredients found in one P&G product called Febreze Air Effects. The test conducted by EWG has revealed some shocking facts. For example, although P&G has placed only three ingredients on the label, there are actually 87 chemicals in their product. Of course, we are talking about only one product from the Febreze line, but the huge difference in the number of listed ingredients leaves room for suspicion about the rest of their air fresheners and their safety. The following is a list of only some of the chemicals that were identified with the EWG test conducted on Febreze Air Effects air freshener. All of them are toxic to humans . BHT – BHT is an endocrine disruptor, neurotoxin and causes toxicity in non-reproductive organs, immune system and irritates both lungs and eyes. Fragrance – This ingredient is listed, but this still doesn’t change the fact that it is an immunotoxin, neurotoxin and allergen. Acetaldehyde – Acetaldehyde has been linked to cancer and it is known as a strong toxin that affects immunity, reproduction and development. In addition it irritates the eyes, lungs and skin. Propylene Glycol – It causes allergies, cancer, builds-up in the body, toxic to immune system and non-reproductive organ system. It is also a skin, lung and eye irritant. Limonene – It irritates the eyes, skin and lungs. It is an allergen and immunotoxin. Alcohol denatured – This is another ingredient that is officially listed in Febreze. It was related to cancer and can lead to reproductive and developmental toxicity. Methyl pyrrolidone – Immunotoxin and allergen, toxic to development and reproduction and acts as a lung, eye and skin irritation. Ethyl acetate – This ingredient was linked to neurotoxicity, reproductive and developmental toxicity, lung, skin and eye irritation and organic system toxicity. Butylphenyl methylpropional – immunotoxin, allergen and lung, eyes and skin irritation. Linalool – Causes irritation in eyes, lungs and skin, a well-known immunotoxin and allergen. Geraniol – Can contribute to the development of allergies. Geraniol is also linked to organic system toxicity, immunotoxicity and eyes, lung and skin irritation. Benzaldehyde – neurotoxin that can irritate the lungs, eyes and skin. Hexyl cinnamal – immunotoxin, allergen, irritator of the skin, lung and eyes. Ethylhexanol – reproductive and developmental toxin that can cause irritation in the eyes, lungs and skin. And few dozen more. You can check the list at the Environmental Working Group website. In addition, you can view the complete report prepared by EWG about the potential dangers of using Febreze and similar cleaners on the following link. Before we suggest some solutions, we should point out that the use of these products is not only risky to our health, but the fact is that they are not cleaning the items and air or completely removing odor. They are used for covering the odor. The odor molecules continue to exist and maybe they are continuing to bring problems to your health. Houseplants that have the ability to purify the air – In this article you will find a list of the best houseplants that can help you freshen indoor air and their efficiency. Removing Odor naturally – In this article you will find out how you can actually remove odors naturally for all types of surfaces….easily and safely. Actually clean the air – Febreze doesn’t clean the air it just covers the odors. However, essential oils can actually clean the air and remove odor for good. There is no need to chemicals, experiencing their side effects and spending tons of money. You can take few simple steps that will keep your home healthy and fresh.